Re-built from the ground up with best in class features across the board, the new L200 is a true next generation pick up truck, it's now more capable, better equipped and stronger than ever. The all-new L200 Titan benefits from the highly capable Super Select system found on the Shogun. On the Titan, with the ease of a turn of the dial four drive modes the highly capable Super Select system provides the L200 with four drive modes, uniquely making the Mitsubishi L200 the only pick-up that can drive in 2WD or 4WD on any terrain. The only pick-up with variable valve timing, the all aluminium diesel engine in the L200 Series 5 weighs 30kg less than Series 4, and is the most efficient and powerful ever in an L200. The L200 Series 5 is more fuel efficient than ever and can save you hundreds per year. Capable of over 700 miles on a single tank of fuel, the L200 Series 5 takes you farther than ever before with a brand new MIVEC diesel engine that doesn't sacrifice power or efficiency. Class leading aerodynamics give the L200 Series 5 best in class acceleration and torque. Ease of manoeuvrability is best in class too with improved steering ratio, a turning radius of just 5.9 metres - the L200 Series 5 is the most dynamic driving pick-up truck on the market. L200 Titan looks the part too, a choice of colours with colour keyed features and great attention to detail including silver air vent surroundings, chrome grille, mirrors & door handles, front fog lamps, privacy glass and 17” alloy wheels with full size alloy spare. The L200 Series 5 double cab delivers comfort and space for the driver and four passengers. Interior specification is comprehensive, impressive value for money as standard. The L200 Titan includes dual zone climate control air conditioning, piano black instrument panel, touch-screen display audio system with DAB with 6 speakers, Keyless Operation System (KOS) with push start button and tilt & telescopic steering wheel. Lane departure warning, an audio and visual alert to the driver when the vehicle drifts out of lane and cruise control, allows more relaxed driving on longer journeys when traffic levels allow by letting you remove your feet from the pedals. Rain senors detect moisture on the windscreen and activates the wipers automatically, whilst dusk sensors switch head and tail lamps on and off automatically depending on the outside light level. The L200 Series 5 has a total load capacity of 4,090kg, more than any competitor and is equipped with Trailer Stability Assist making towing safer than ever. 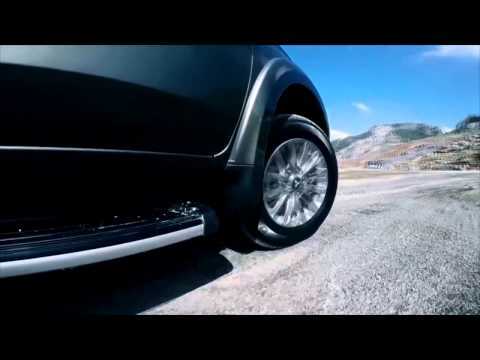 With Trailer Assist working in conjunction with the M-ASTC system (Mitsubishi Active Stability & Traction Control). Sensors detect when the trailer sways side to side. Braking is applied to the vehicle to stabilise the motion automatically activating the rear brake lights when the system is activated. Arrange a test to see for yourself why the L200 Series 5 is proving to have a winning formula, receiving industry accolades from Auto Express Best Pick-up 2015 and 2016, and What Van Pick-up of the Year 2016... 'with a modern engine, fuel economy and high specification the latest Mitsubishi L200 pick-up truck sets new standards in the UK pick-up class'. For more details of the Mitsubishi L200 Series 5 range and to arrange a test drive please contact the Firs sales team on telephone 01608 737349. Competitor comparisons are made against all equivalent models in the segment and were correct at time of publication. Total load capacity: For all pick-up trucks the total load capacity will be reduced when taking into account a tow bar and additional equipment.